Arthur Szyk, Four Freedoms Stamps, 1942. Issued by the Emergency Committee to Save the Jewish People of Europe. Sheet of stamps. Courtesy of the Norman Rockwell Museum Collection. 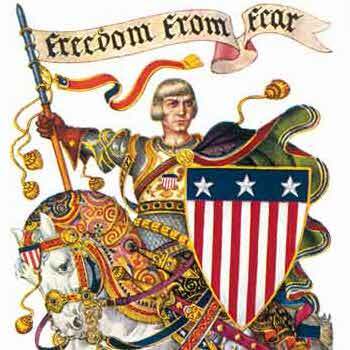 Arthur Szyk’s Four Freedoms Stamps consist of a repeated sequence of four different stamps, which depict, from left to right, freedom of speech, freedom of religion, freedom from want, and freedom from fear. Each stamp has an illustration depicting a recurring male character, and is labeled with the freedom with which it is associated. In freedom of speech, the man stands at a podium, speaking passionately to an audience outside the frame of the stamp. His left hand points towards the “Freedom of Speech” banner overhead. In freedom of religion, he kneels on a prayer bench with hands clasped, looking upwards, perhaps towards the “Freedom of Religion” banner. In freedom from want, he is surrounded by an absolute plethora of food. He holds a wine glass in his hand, perhaps raising a toast to the viewer. Finally, in freedom from fear, he is depicted on the back of a horse in knight’s garb. He looks bravely out into the distance, holding the flagpole with the “Freedom from Fear” flag firmly in his hand. The stamps are colorfully illustrated in the illuminated manuscript style, based mainly on primary colors, making it very vibrant and eye-catching. Although the illuminated manuscript is characteristic of art from the Middle Ages, it is combined with motifs commonly associated with American history, such as the flag itself, to create a strangely cohesive effect throughout the work. Szyk’s Four Freedoms Stamps were undoubtedly created as political propaganda to promote the ideas and ideologies associated with Franklin D. Roosevelt’s Four Freedoms, which he introduced in his 1941 State of the Union address. Combined, the four stamps paint a picture that impressively portrays the American government’s mindset during the Second World War. Despite the increased popular support for involvement in the war as a result of the Pearl Harbor attack in late 1941, in 1942 it was still relatively rare for various reasons. A large cause of this was that the country’s economy was still recovering from the Great Depression of the 1930s. Many Americans were preoccupied with getting back on their feet after the economic shock the Depression was responsible for, and others were concerned that with the struggling economy, the country would be unable to sustain itself through wartime. Furthermore, the aftermath of the First World War and the subsequent dissatisfaction with Article X of the Treaty of Versailles caused a generally isolationist mentality nationwide. To garner civilian support, the Office of War Information and other organizations enlisted artists to create pro-war propaganda. The organization that commissioned the Four Freedoms Stamps in particular was the Emergency Committee to Save the Jewish People of Europe. The various images that Szyk and other artists painted of the Four Freedoms greatly appealed to the contemporary concerns and values of the public. Although President Franklin D. Roosevelt’s original purpose of introducing the Four Freedoms was to encourage international cooperation in a time of difficulty and strife, many American artists of the time narrowed their focus to a domestic one in order to better appeal to the audience and accomplish their goal. They were eager to portray America as an ideal example of freedom, the beginning point of an arsenal of democracy, causing commentary on American ideals to become increasingly ethnocentric. Clearly, the effort spread far enough to infiltrate aspects of life that are as mundane as stamps. Combined with the work of other nationalistic artists and the government, support for American involvement in the Second World War slowly grew. Although all the propaganda artists at the time were commissioned for the same reason, it is also important to consider that the way that Szyk chose to express the Four Freedoms has its differences from the portrayals of other artists, such as Norman Rockwell. Rockwell, perhaps the most well-known propaganda artist of the time, portrayed the American war effort in an extremely idealized light. This is evident in not only his Four Freedoms paintings, but also in other works, such as his Willie Gillis series. Meanwhile, although Szyk’s Four Freedoms Stamps in particular are typically interpreted as more idealistic than realistic, the majority of Szyk’s works were hyper-realistic in that they expressed a more violent and harsh version of what was happening in Europe. The blatant disparity between what artists working for the same cause believed should represent the Four Freedoms served to both split the American public between different portrayals and to unite them behind a common cause. Borgwardt, Elizabeth. “FDR’s Four Freedoms as a Human Rights Instrument.” OAH Magazine of History 22, no. 2 (2008): 8-13. http://www.jstor.org/stable/25162165. Gutierrez, Robert. “Chapter 3: The Four Freedoms Viewed in Comparison to Traditional American Political Ideals.” Counterpoints 271 (2007): 33-40. http://www.jstor.org/stable/42979033. Nystedt, Bob. “Four Freedoms.” Phylon (1940-1956) 15, no. 1 (1954): 39. doi:10.2307/271903. Schmulowitz, Nat, and Lloyd D. Luckmann. “Foreign Policy by Propaganda Leaflets.” The Public Opinion Quarterly 9, no. 4 (1945): 428-93. http://www.jstor.org/stable/2745556. Smart, Mabel Wilson. “Making the Four Freedoms a Reality.” The Journal of Educational Sociology 18, no. 1 (1944): 29-38. doi:10.2307/2262988. “The Four Freedoms: Statement by the Office of War Information.” Bulletin of the American Association of University Professors (1915-1955) 28, no. 4 (1942): 437-51. Wilcox, Francis O. “Government Pamphlets on the War.” The American Political Science Review 38, no. 1 (1944): 58-71. doi:10.2307/1949423.